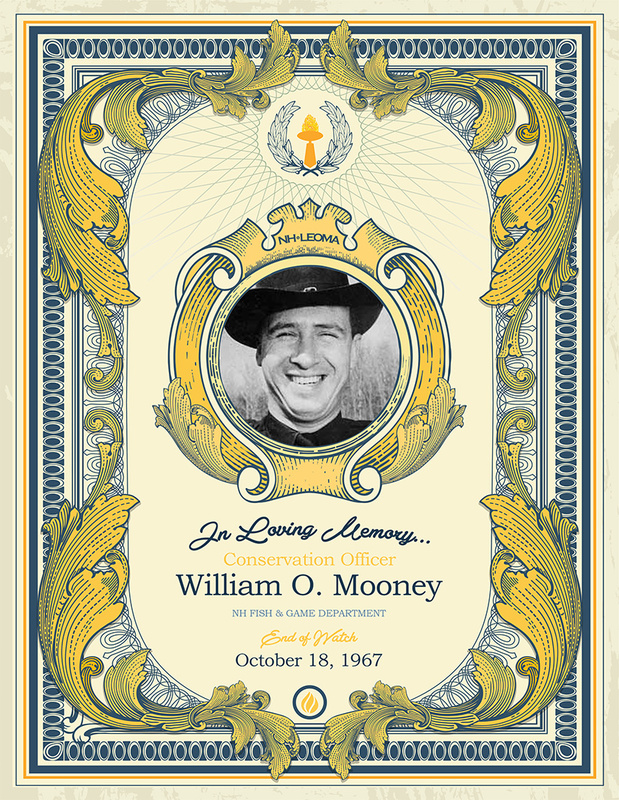 Conservation Officer William O. Mooney was born March 4, 1925 in the northern town of Littleton, New Hampshire. During World War II he served in Europe as a radio operator and gunner in the Mighty Eighth Air Force and was stationed in England. After reaching the rank of staff sergeant he received an honorable discharge in 1945. Bill returned to Littleton, NH after the war and married Kathleen “Bunny” Bronson. Shortly after the births of their two daughters, Sally and Susan, Bill was appointed as a Fish and Game Officer and was assigned to the Bristol area. In the late 1950’s he took a course in SCUBA diving and was one of three divers in the Fish and Game Department at the time. He was well known throughout the state for his underwater search work. He was a frequent speaker before groups interested in conservation in New Hampshire and always accompanied his talks with pictures he had taken of native wildlife. The summer of 1967 Bill had completed climbing the 46 mountains of New Hampshire having altitudes of more than 4000 feet, thus becoming eligible for membership in the Appalachian Mountain Club’s Four-Thousand- Footer club. He was also in demand as a soloist at church and community affairs. On October 18, 1967 while on patrol in the Whittemore Point area of Newfound Lake in Bridgewater he suffered a stroke. He was taken to the Mary Hitchcock Memorial Hospital in Hanover where he died later that evening from complications relating to the stroke.